Ozone Air Treatment – Airzure – Wassertec UV Ozone Generator – disinfects and deororises air. Ozone air treatment. The Airzure ozone air treatment system has been specifically designed and manufactured as a safe, simple and effective way of neutralising odours and sanitising air in any indoor environment. The system uses ultraviolet to sanitise and freshen the air and is simple to service, with the UV lamp lasting up to 9 000 hours. Then it’s as easy as changing a light bulb! 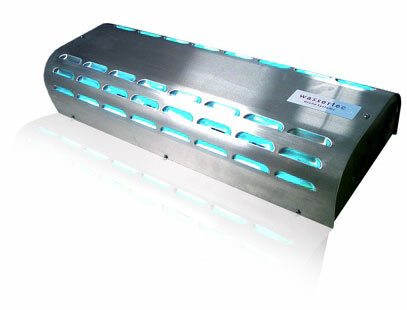 It is ideal for freshening hotel and guesthouse rooms, smoking areas, cold storage areas and particularly odourous retail outlets like butcheries, fast food outlets and fishmongers. It is also effective in cancelling out mildew smells and that strong smell left behind in a freshly painted area. For further information and the specs, download the brochure or contact us with any queries.